Titan’s VIP door-to-door travel service collects you from home for your flight to Ho Chi Minh City. Following an early morning arrival into Ho Chi Minh City we transfer to the Renaissance Riverside Hotel (4T+). An early check-in has been arranged to allow time to relax and refresh before we start exploring the city formerly known as Saigon. This afternoon we head to the former Presidential Palace. In 1975, a soldier ran into the building to unfurl a VC flag from the balcony, symbolising the transfer of power from General Minh. This landmark is now a museum of meeting rooms and reception rooms, the president’s living quarters, and a fascinating war room and telecommunications centre. We then take a stroll to the major colonial sights of the city, including the Opera House and the Old Saigon Post Office, designed by Gustave Eiffel. We leave the old capital behind, and drive through scenes of rice paddies and villagers drying noodles by the roadside as we head to the Cu Chi district. The famous Cu Chi Tunnels are an incredible underground network, constructed by Vietnamese resistance fighters (Viet Cong) during both the French and American wars to house troops, transport and supplies. Our visit highlights what life would have been like as a communist guerrilla, seeing living quarters and typical meals, and rifles, booby traps and command centres. After lunch at a local restaurant, we return to our hotel for some time at leisure. This evening we take in views of the city as we enjoy a dinner cruise on the Saigon River. We depart for Cai Be, on the Mekong Delta. This town relies on the network of rivers and canals to produce rice, as well as using it as a highway for vessels distributing agricultural products. We take a boat trip to see the local trading boats and visit some home factories that produce rice paste, rice popcorn and coconut candy. We continue along meandering tributaries to evergreen islands, and take a short walk through a local village and fruit gardens to a preserved ‘Mandarin’ house, built centuries ago. The owner will serve an appetising Vietnamese lunch before we continue to Tan Phong Island, where we take a rowing boat through the canals. We then continue to our hotel, the Mekong Riverside Resort (3T). We return to Ho Chi Minh City to board the North-South Railway (known as the ‘Reunification Express’) for a 7.5-hour journey through towns and rice fields to Nha Trang. Upon arrival in Nha Trang this evening, we transfer to our hotel, the Novotel (4T). We take a tour of this seaside city, including Hon Chong, a quiet fishing village with a bay of karsts like a mini Halong Bay; and the Po Nagar Cham Towers. The four surviving towers are still actively used for worship by Cham, Chinese and Vietnamese Buddhists. We also visit the Long Son Pagoda with its enormous white Buddha statue, and the Oceanographic Museum, which displays the local marine environment, including reef sharks, turtles and sea horses. Enjoy lunch at a local restaurant before an afternoon at leisure. Enjoy a morning at leisure before we make our way back to the station for a train to Danang. We arrive in Danang late tonight, and transfer to Hoi An and our hotel, the Hoi An Historic Hotel (3T+). Learn about rural life in Tra Que Village. We visit a farm and help the farmers prepare the land, fertilising it with seaweed, raking, sowing and picking crops. Afterwards we see how to prepare tam huu – paperless spring rolls, and try this irresistible delicacy. We return to Hoi An for lunch at a local restaurant before a walking tour of the ancient town centre. We visit former merchants’ houses, a Chinese communal hall, the colourful market and the beautiful little 400-year-old Japanese Covered Bridge. The former capital and religious centre of the Champa Kingdom is our destination this morning. My Son’s skyline is shaped by dozens of red brick towers and sanctuaries dating from between the 7th and 13th centuries. We tour the temples, get an insight into Cham culture, and learn how even this remote site was not immune to bombing during the Vietnam War. On our way back to Hoi An, we stop to visit Tra Kieu, formerly known as Simhapura or the Lion Citadel, the capital of Champa between the 4th and 8th centuries. Some of the finest sculptures in Danang’s Cham Museum originated from here. Journey first to Danang to visit the Cham Museum, which contains the world’s finest collection of Cham sculptures, then drive over the dramatic Pass of Ocean Clouds, where forts, pillboxes and defensive walls mark the former national frontier. The road drops down to the coast, and the wonderfully photogenic fishing village of Lang Co. We have some time here for lunch before we visit the Mausoleum of Tu Duc. The tomb was used as a palace retreat before becoming the Emperors’ resting place. We also visit Tu Hieu Pagoda, a serene Buddhist haven which still shelters 70 monks, and Khai Dinh’s Tomb which is grandiose, yet traditional Vietnamese in design, with a unique European touch. We head into Hue and check in to the Indochine Palace (4T+). We start our tour of Hue at the Imperial Citadel, modelled on Beijing’s sprawling Forbidden City, from where the Nguyen Dynasty ruled from 1802 to 1945. The French and American wars destroyed a large portion, but UNESCO is assisting with its restoration. We then take a boat trip on the Perfume River to Thien Mu Pagoda. The 21m-tall tower at the centre of the pagoda was constructed to fulfil an old woman’s prophecy of prosperity. Enjoy a stroll through the Dong Ba market, the biggest commercial centre of Thua Thien Hue Province, before lunch at a local restaurant. The rest of the day is at leisure. Early this morning we transfer to the airport for our flight to Hanoi. We check in to the Lapis Hotel (4T) or Hilton Hanoi Opera (4T+), before we visit Hoa Lo. This huge prison held anti-colonial revolutionaries and prisoners of war in often cramped, inhumane conditions. Our next stop is the Temple of Literature, Vietnam’s first university, constructed in 1070. Later, we drive to Hoan Kiem Lake and take a walking tour of Hanoi’s Old Quarter. This bustling area of narrow streets and alleys is home to thousands of small businesses and shopkeepers. 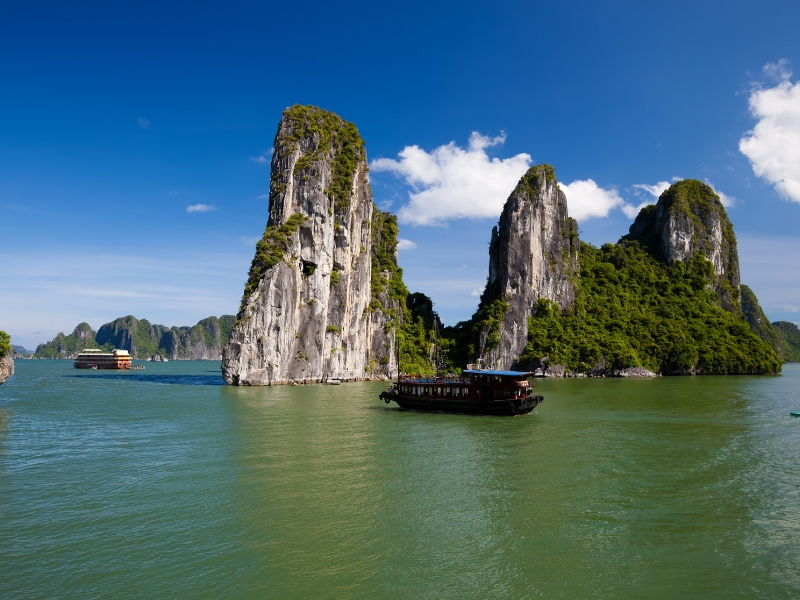 Travel to Halong Bay, where we board the Indochina Sails (4T). Our overnight cruise begins as we take lunch on board this modern, yet traditional vessel. In the afternoon, enjoy activities or just relax as we sail amongst the thousands of forest-topped pillars that fill the bay. Towards the end of the day the boat sets anchor for the night among these towering karst formations. Wake early for an unforgettable sunrise, and enjoy breakfast as we cruise slowly back towards port. We disembark and make our way back to the Lapis Hotel (4T) or Hilton Hanoi Opera (4T+) in Hanoi, stopping for lunch en route. The rest of the day is at leisure. Today’s excursion starts at the monumental marble mausoleum of Ho Chi Minh, the historic figure and father of modern Vietnam. We then visit his home from 1954-1969, a simple wooden house; and the One Pillar Pagoda, an important symbol of Hanoi founded by King Ly Thai To in 1049. We continue to West Lake and Tran Quoc, one of the oldest Buddhist pagodas in Hanoi; and the nearby Toaist temple of Quan Thanh, which dates from the Ly Dynasty. If time permits, we also visit the ancient Hanoi Citadel, an intriguing relic with many artefacts dating as far back as the 6th century. Spend the afternoon at leisure, before we finish our day with a Water Puppet Show. This uniquely northern Vietnamese art form depicts scenes from rural life and episodes of national history. The majority of the day is free before our late evening transfer to the airport for your return flight to the UK.